Home Unlabelled Amazon India Is Offering 3 Days "Great Indian Sale"
Amazon India Is Offering 3 Days "Great Indian Sale"
Amazon India is running a 3 days limited Great Indian Sale on their official website www.amazon.in and today is the first day to avail some great offers – deals and heavy discounts on different types of product. These three days are 20th, 21st and 22nd of January. It’s the right time to purchase one of the product of your choice that you were looking for to purchase and that is also with offers and discounts by online shopping. And Amazon India is offering different types of discounts on various product categories. 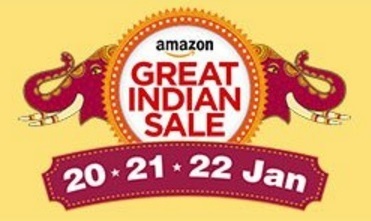 Amazon Great Indian Sale is included almost each and every products categories whether it is Smartphone Handsets, Tablets, Laptops, Television Sets, Washing Machines, Clothes, Beauty products, cosmetics or it is eatables & grocery items Utensils, all kitchen appliances, products and Consumer Durable. Products are being sold almost of each category not only great offers and heavy discounts are being given on their MRPs prices. Amazon India is also providing an additional discounts on SBI Credit and Debit Cards. The Limit of the discounts on SBI cards is only upto 10 percent on your PCs and Laptops but it goes upto 15 percent discounts on android devices apps. So, what are you waiting for go and grab your product and have this discounts. Amazon is also offering App Only Schemes for the buyers and customers. In this scheme it is offering 10 Renault Kwid Cars and 10 musafir.com Europe trips for the top and lucky customers with terms and conditions applied on it. Amazon is also having 15 percent of an additional discounts offer on Amazon Pay Balance. So, check for the best buy offers and go ahead…..